A New Map Of Ohio with its Canals Roads And Distances. 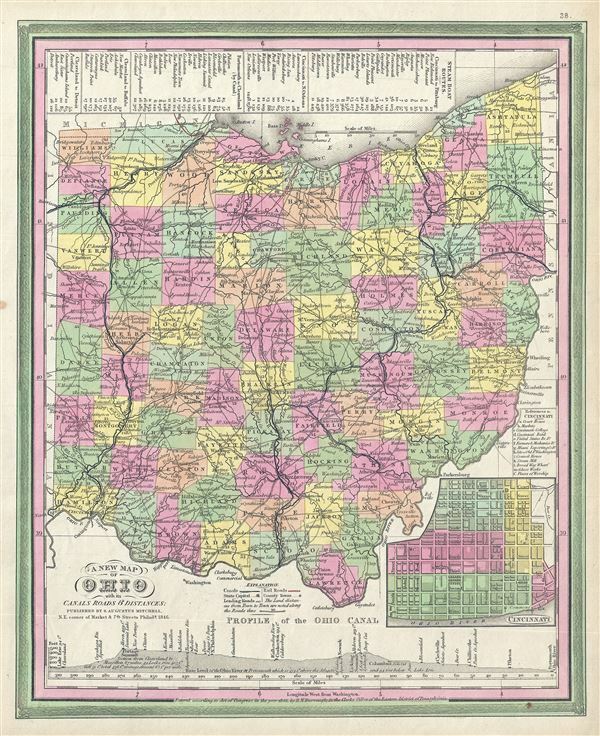 This scarce hand colored map is a lithographic engraving of Ohio dating to 1846 by the legendary American Mapmaker S.A. Mitchell, the elder. Includes a detailed inset map of Cincinnati. Along the bottom there is a profile of the Ohio Canal with navigational notes. This is a rare transitional map produced by the mysterious engraver H. N. Burroughs, whose work for the Mitchell firm appears in 1846 between that of H.S. Tanner and Mitchell himself. Ristow notes, 'Nothing is known about Burroughs, but he was undoubtedly an employee or associate of Mitchell.' His fine and detailed work appears only in the hard to find 1846 edition of the Mitchell's Atlas. Entered according to Act of Congress in the year 1846, by H. N. Burrows in the Clerks Office of the Eastern District of Pennsylvania. Rumsey 0537.029. Philips (Atlases) 6103.